If you are encountering a WordPress error message or white screen, don't panic. Someone will have encountered the same message before and it can easily be solved. This page lists the most common WordPress errors experienced by WordPress users, and provides a starting point for fixing them. You will also find links to more detailed pages on the WordPress Codex. If you can't find your answers here, try the WordPress Support Forums where a volunteer will be there to help. Both PHP errors and database errors can manifest as a white screen, a blank screen with no information, commonly known in the WordPress community as the WordPress White Screen of Death. Your Theme may be causing the problem. This is especially likely if you are experiencing the white screen of death after you have just activated a new Theme. Log in to the WordPress Adminsitration Screens and activate the default WordPress Twenty Fourteen Theme. If you can't access your Administration Screens, access your website via FTP and navigate to the /wp-content/themes/ folder. Rename the folder for the active Theme. Try deactivating all of your Plugins to see if it is a Plugin issue. If you are unable to access your WordPress Administration Screens, deactivate your Plugins via FTP by following these instructions. Switch the Theme to the WordPress Twenty Fourteen Theme to eliminate any Theme-related problems. 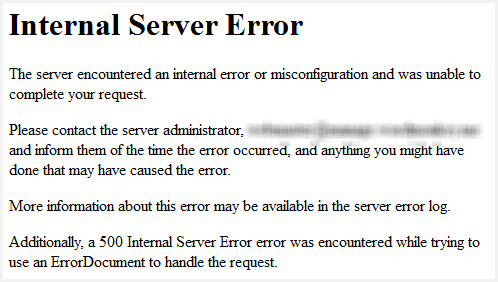 If you get a page featuring the message "Error Establishing Database Connection," this means that there is a problem with the connection to your database and there could be a number of reasons for this. The following are possible reasons and solutions. If you are sure your configuration is correct you could try resetting your MySQL password manually. Your database has met its quota and has been shut down. Contact your hosting provider to see if either of these issues is causing your problem. If you have checked wp-config.php for errors, and confirmed with your host for hosting issues, it is possible that your site has been hacked. Scan your site with Sucuri SiteCheck to ensure that it hasn't been compromised. If it has you should check out My Site was Hacked. A blank white screen and no information. A warning that the update failed. Switch to the default WordPress Twenty Fourteen Theme. This should rule out any Theme-related problems. Increase the maximum execution time in your php.ini file. This is not a WordPress core file so if you are not sure how to edit it, contact your hosting provider to ask them to increase your maximum execution time. See instructions for increasing maximum execution time. When WordPress updates, it automatically installs a .maintenance file. Following upgrade, you may receive a message that says "Briefly unavailable for scheduled maintenance. Please check back in a minute." The maintenance file may not have been removed properly. Read more about the maintenance mode issue. If you are making changes to your website and you do not see the changes in your browser, you may need to clear your browser cache. Your browser stores information about the websites that you visit. This makes it faster to load websites when you visit them because the browser just has to reload information already stored on your computer, rather than downloading it again. If you make a change to a website and the browser does not think it is significant, it will simply load the data from your cache, and you won't see your changes. To fix the problem, simply empty your browser cache or close the tab and reopen the link. If you are experiencing 404 errors with pretty permalinks and a white screen when you upload images, mod_rewrite may not be enabled in Apache by default. Mod_rewrite is an extension module of the Apache web server software which allows for "rewriting" of URLs on-the-fly. It's what you need to make pretty permalinks work. If you are not familiar with editing your .htaccess file, contact your hosting provider to ask them to turn on mod_rewrite rules. There is more information on pretty permalinks in the WordPress Codex. Log in to your WordPress Administration Screens, navigate to Settings > Permalinks. Select the default permalinks. Save. Then reselect your preferred permalinks. This will flush the rewrite rules and should solve your problem. There are a number of different errors that will appear in your error logs. To access your error logs you will need to turn on debugging and then locate your error log via FTP. The following information will help you to decipher some of the common error messages. Below are some common PHP error messages. If you receive a warning that WordPress cannot modify header information and headers are already sent, it usually means that you have spaces or characters before the opening tags or after the closing tags. Read how to fix the headers already sent error. If you are experiencing this problem when you have just installed WordPress you may have introduced a syntax error into wp-config.php. These instructions will help you to fix the error. An error when trying to auto-install or auto-upgrade a Plugin. Try installing or upgrading the Plugin manually. An error when trying to auto-install or auto-upgrade a Theme. Try installing or upgrading the Theme manually. You may be using an incompatible WordPress Plugin or incompatible Theme. This could happen with older versions of WordPress and a new WordPress Plugin, or if you are trying to use a WordPress Multisite Plugin on a single site installation. Upgrade WordPress to resolve this issue. You may be trying to call a function that doesn't exist. Check functions.php for misspellings. Try deactivating the WordPress Plugin or changing the WordPress Theme that caused the error to appear. If you are unable to do this from within the Administration Screens, you may have to do this manually via FTP. The following errors may appear in relation to your WordPress database. Alter alter the tmpdlr variable to point to a writable directory. This error occurs when the user assigned to the database does not have adequate permissions to perform the action to create columns and tables in the database. You will need to log in to CPanel or Plesk to give your database user adequate permissions. Alternatively you can Using_cPanel#Step_3._Add_User_to_Database create a new user to assign to your database. If you do create a new user you will need to ensure that it is updated in wp-config.php. Your cache on your server is full. You should contact your web host to resolve this. You have too many files in your /tmp. Again, contact your web host. You can read more about Error 28 in the Troubleshooting FAQ. This indicates that a table in your database is damaged or corrupted. If you are comfortable using phpMyAdmin you can use these instructions on repairing your MySQL database tables. Always backup your database before performing any actions on it. If you have not used phpMyAdmin before, or are uncomfortable doing so, contact your web host and ask them to run CHECK/REPAIR on your database.